The late Professor John D. Schopp was deeply appreciated by his colleagues and students. 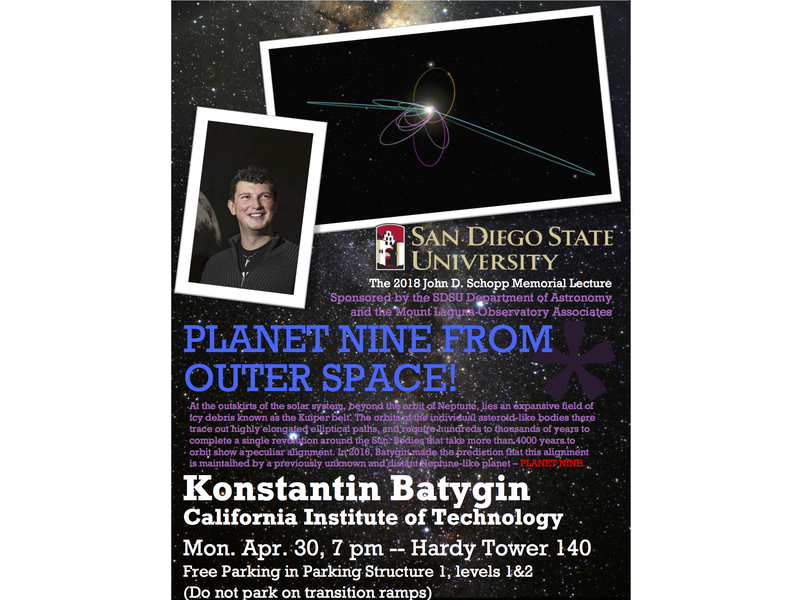 Each year the Department of Astronomy at San Diego State University, in conjunction with the Mount Laguna Observatory Associates, hosts a public lecture in Dr. Schopp’s memory. They honor his love of astronomy and his devotion to sharing knowledge. John Schopp was born on October 18, 1927, in St. Joseph, Missouri. He received his Bachelor of Science in Astronomy from Northwestern University in 1949 and his Doctorate in Astronomy from Princeton University in 1954. His first faculty position was at the University of Missouri. He left MU to join the faculty at SDSU in 1962. We, students, friends, and colleagues, wish to express our appreciation to you for your friendship, excellent teaching, and unselfish dedication to racial equality. At SDSU, John was instrumental in developing the very successful master’s degree program in astronomy and was graduate advisor for many years. He organized summer institutes in astronomy for high school science teachers. In 1975, he was local organizing committee chairman for the 146th meeting of the American Astronomical Society, which met in San Diego for the first time. He also served as associate dean of the College of Sciences for ten years. John prepared thoughtful lectures for his students, asked thought-provoking questions in the classroom and on exams, and assigned grades with great care. He mentored new faculty members on the art and craft of teaching. John had many interests and passions. An early advocate of the civil rights movement, he was once arrested for participating in a CORE-sponsored sit-in at Columbia, Missouri. Following his strong convictions against the Vietnam War, he became alocal organizer for the Peace and Freedom Party of California. As a young man, John was a skilled catcher and hoped to become a professional baseball player. That did not work out, so he became an astronomer instead. He still liked playing baseball and listening to the games, though. He was a voracious reader of literature, history, and adventure stories. The exploits of the early Antarctic explorers fascinated him, especially the expeditions of Sir Ernest Shackleton. John also appreciated classical music. He developed a deep understanding of and abiding love for the piano sonatas and string quartets of Beethoven. In his later years, he took up the Japanese board game of Go. Above all, John liked being around people and seldom passed up an opportunity to enjoy the company of others. He relished the exchange of ideas and opinions. John’s refuge was his peaceful garden, which he and his wife, Fay, nurtured with skill and devotion. He frequently invited the entire astronomy department, along with others from the SDSU community, to the garden for light refreshment and good conversation on Friday afternoons. John Schopp died on November 9, 1988, from a heart attack he suffered while playing Go with friends in his beloved garden. Those who knew him miss his wit and warmth. Please write checks to The Campanile Foundation with an on-check memo for the Schopp Lectureship Fund. All contributions are tax deductible, and will be acknowledged by mail from The Campanile Foundation.